“A lot of people put in the passion to make it happen, to protect one another and people they don’t know,” NAC organizer Jamie Burkart told me. “We are activists and artists, we can do more when we organize together.” He also added that over 100 people have signed up for the Coalition’s “mutual aid” network, offering up skills ranging from zoning know-how to DJ access that could be of use to the community. The meeting was only one more step in a process of finalizing the community’s formal recommendations for the DCA. Here are some of the useful takeaways we got from the evening’s discussion. 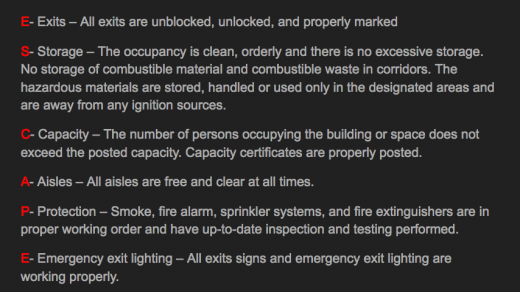 Screenshot from Tara McManus’s fire safety presentation, explaining the common ESCAPE acronym. 1. Fireproof the stage curtains. Tara McManus of fire and flow arts space The Floasis, described as “NYC’s first legal fire performer,” gave a presentation on fire safety and prevention at the meeting, available in its entirety here. She analyzed several case studies like the Station Nightclub fire in Rhode Island and the recent Second Avenue explosion, pointing out what aspects of the floorplan or items in the space affected how fire starts or travels. For example, dust is highly flammable, as are tangles of electrical cabling and fabric. 2. It’s easy to become a fireguard, and you should do it. “I recommend anyone with a DIY space go on the FDNY site [to get a] F-03 fireguard license,” McManus said to the crowd. Getting this license is relatively easy, and involves a written exam and a $25 fee. The certificate must be renewed every three years. Being a fireguard may sound intimidating, but it’s sometimes basic knowledge that can come in handiest. “Something as simple as standing by the door yelling ‘This is the exit’ can save lives,” she said. Exits are also crucial, as oftentimes fire becomes most life-threatening when an exit gets clogged due to a rush of people trying to get out. “Fire exits should be marked and open out onto the street with a push bar,” McManus said. 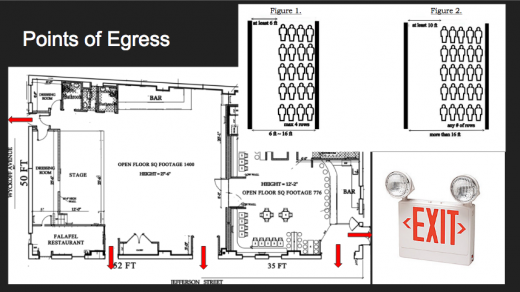 Screenshot from McManus’s fire safety presentation, detailing proper points of egress at House of Yes’s current location. 3. Community boards are your friend. 4. 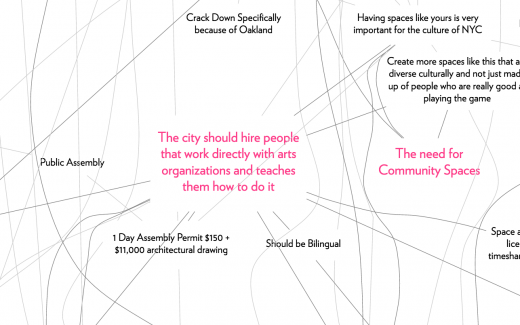 If you’re not a nonprofit, you can borrow one. Getting 501(c)3 certification as a nonprofit can be very useful, as it allows your organization access to far more grants and the ability to accept tax-deductible donations. For those without the time or know-how to invest in obtaining nonprofit status, there are ways to essentially borrow it. Institutions like the Brooklyn Arts Council and Fractured Atlas offer fiscal sponsorship to both individuals and groups, allowing them to use their nonprofit status for an amount of time. If you are a nonprofit and seeking more funding, applications for the NYC Cultural Development Fund are due February 13. 5. Marches can create change for good, MARCH perhaps less so. “They act like thugs, they come in and target people,” said one attendee. “This cuts off communication before it starts.” They were referring not to some obscure gang but to MARCH, or “Multi-Agency Response to Community Hotspots.” MARCH is an interdepartmental task force, where members of the FDNY, NYPD, DOB, and so on come together for one mission. MARCH was responsible for the raid of Silent Barn in 2011, and even more legit spaces like LES bar No Fun in 2015. 6. Loft laws are expiring soon. Those living in certain industrial areas of Greenpoint, North Brooklyn, and Maspeth could be eligible for Loft Law, a law “designed to protect tenants in NYC who are illegally living in commercial or factory buildings.” This law uniquely allows those living in buildings not up to code a grace period of sorts, giving time for the building to become a legal live/work space, even though the DOB is aware of its current illegal aspects. This law could be useful to many, but it will not be around forever. Extension to the Loft Law coverage deadline (or leaving it permanently open for application) was one of the line items NAC is considering presenting to the DCA, but for the time being the deadline is June 26. If you’d like to get involved with the NYC Artist Coalition and become a part of the initiative to (hopefully) enact tangible change in the way the city approaches DIY spaces, their next meeting will be at a TBD date in March.